It was bottling day yesterday at Bill HD’s for our latest batch of “hefeweizen” beer. 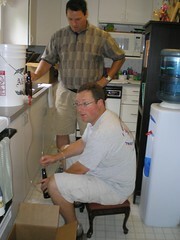 This picture shows Bill (seated) and Steve B running sanitizer through all of the bottles– remember, clean is your friend when bottling beer– but the process for getting the beer in there is the same. Beer comes out of the bucket, which the beer has been transfered into from the carboy (see video below), it’s put into bottles, it’s capped, and we wait. I think it’s fair to say that we’re all a bit more nervous about this batch than the last one we made. On first taste, this beer tastes… well… okay, but we hope that it benefits from a bit of bottle aging. At least two weeks. Since we’ll be out of the country in two weeks (and I don’t think it’s worthwhile to take a homebrew with me to Germany), my share of the loot will be even more aged. On the up-side though, there doesn’t appear to be any problems from the previously mentioned “blow-off,” which we thought might contaminate the batch. Our assumption is that if there was some sort of problem, the beer would taste like poo. And while it isn’t a great beer, it isn’t a poo-flavor, either. I took some video with my camera, but I also learned a valuable lesson I will apply on our upcoming vacation: if I turn the camera sideways, I end up with sideways video. So, to properly view this footage, please turn your computer and/or monitor 90 degrees counter-clockwise before viewing. It’s not particularly exciting footage, either; it’s beer being siphoned through a tube from the carboy to the fermenting bucket (aka “ale pail”), from which we will later bottle. Twenty-two seconds worth, and it’s 6.6 MB. I would have included the other movie I took, but Steve B. and Bill kept making rude gestures. Bastards…. I am not really nervous about this one. The fruity (esters) aroma is exactly what we were told to expect, and this is a beer that needs to be served cold and fizzy, for sure. We took steps to make sure it will be fizzy, and after 2 or 3 weeks and a day or so in the fridge, I am sure it will be just fine. There weren’t any off flavors, as you note, so my worry is over. So you really should say this isn’t a great beer…yet. What is interesting, though, is just how different the two “beer watcher” beers are in character. When you go from a triple-hopped IPA to a Hefe, you are really exploring two far reaches of the flavor universe. Also, one correction – the movie shows us racking the beer from the carboy to the bottling bucket, not a fermenting bucket. (The bottling bucket has a hole for a spout). I’m glad your beer doesn’t taste like poo. I can’t imagine that would be good. I’ve had Coors Light which is as close to poo-beer s I’d ever want to get.